But with help from Mencap Adam, who’s 26, secured an interview at our Living store in Hull, got the job, and now he’s going from strength to strength – proving really popular with customers and colleagues and even helping found a group that advises employers how to open up more opportunities for people with disabilities. Adam, who has attention deficit disorder (ADD), Asperger’s and mild dyspraxia, joined the store last August, working part time. Sue says his learning disabilities mean he can read and spell, but struggles with writing. “I’m really enjoying working at Asda,” said Adam. “It’s very good. My favourite thing about the job is interacting with people and I get on well with customers and colleagues. The store’s replenishment section manager Julia Ragbetli interviewed Adam for his job. She said: “He’s a great colleague. Colleagues and customers love him. He loves his job and is so enthusiastic. 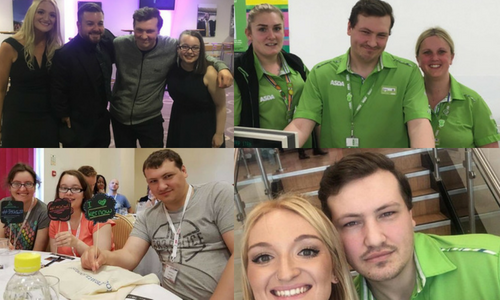 Mencap Humber supported Adam for the last seven years – providing advice while he was looking for work, helping him get an interview, and continuing to keep a close eye on how he’s getting on. Emma Hoe, employment coordinator for Mencap Humber, said: “Adam was ecstatic to have finally secured his first job, and he’s really liked having the flexibility of part time hours. “Getting this job has meant huge benefits to his well-being; his confidence has risen and he’s much happier. “His friends and family have commented that it has been amazing to see such a positive difference in Adam, who they always knew would be great in a retail role. Work has given him a real sense of purpose and pride. Emma says Adam’s ADD means he prefers varied tasks and roles. She said: “He likes to be on his feet doing different things rather than spending all his shift on a checkout. His dyspraxia means his eye to mind coordination is a little bit delayed. For example, if there’s a hazard in front of him it means it will take him a little bit longer to recognise the hazard. Adam’s also a founder member of People’s Awareness of Disability and Difference, a group which aims to help young people who are struggling to find career opportunities. This was formed in 2015 and is part of the Big Lottery-funded project Talent Match Humber.